Monthie Mechanical Inc is proud to serve the Nicholasville community! About Nicholasville, KY - Happy to be your hometown Heating & Air Conditioning Contractor! Nicholasville, Kentucky is located in Jessamine County approximately twelve miles to the south of the city of Lexington. 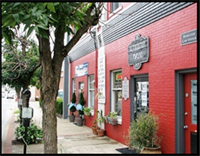 Founded in 1798 by European Americans, Nicholasville today is a bedroom community that is home to approximately 28,000 residents who enjoy the shopping, cultural, and entertainment benefits of the town’s proximity to the city Lexington. With the enjoyable seasonal weather that brings long, hot summers and mild, cool winters, Nicholasville is an excellent choice to live or visit anytime of the year! The town of Nicholasville is an agglomeration of historical, cultural, and entertainment venues! Nicholasville features several buildings from the 1800s that are listed on the National Register of Historic Places. Located in the town’s historic downtown district is the Old Jessamine County Jail, circa 1870s, a restored jail and jailer's residence that now serves as a venue for local meetings and events. The Jessamine County Courthouse, also located downtown and completed in 1878, was designed by Pittsburgh architect Thomas Boyd and features an eclectic Victorian period style design. History buffs will enjoy visiting the Camp Nelson Civil War Heritage Park, constructed in 1863 by the 9th Corps of the Army of the Ohio under command of Major General Ambrose Burnside. Camp Nelson served as a quartermaster and commissary depot that provided supplies for federal troops stationed in Eastern Kentucky and Eastern Tennessee. The Museum of Physical Security is an interesting gallery that contains the lock collection of Henry C. Miller that is thought to be the largest and most complete collection of locks and security devices in the world. Several venues located in and around the town of Nicholasville offer entertaining activities for outdoor sports and nature enthusiasts. The Sugar Creek Resort and Jim Beam Nature Preserve are located within minutes of the center of town and feature activities that include hiking, birding, horseback riding, nature study, photography, kayaking, and canoeing. The town of Nicholasville, with its host of fun things to do and interesting places to see, is a warm, friendly community that is a great place to explore, spend time, and enjoy!